Otus is a innovative and free Learning Management System for the 1:1 classroom environment. It is available as a free iPad app for teachers and students and works on any browser based device such as a Chromebook. 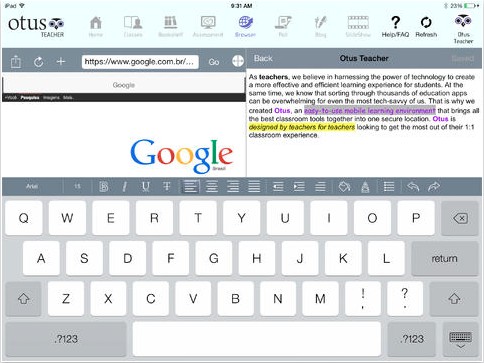 Otus allows educators to use a single Google login to hand out/in assignments, track/assess/monitor/grade students, poll and browse the web, annotate, and so much more in a safe mobile environment. Best of all, Otus is free, can be used in a number of different, and works in real-time for taking attendance, assessing students, and getting instant feedback through polling.